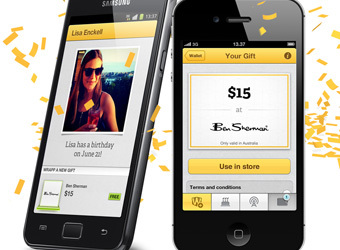 Social gifting – the act of giving a gift voucher or the like to a friend online and a trend that could replace discounting strategies with peer recommended financial incentives – has landed in Australia. Leader of the pack in what’s being billed as the next shopping phenomenon, Wrapp, launches locally today, enabling users to give Facebook friends free and paid gift cards from retailers including Lorna Jane, Industrie, Speedo, Roses Only and Booktopia. A range of other retail brands have also signed on for the Australian launch of the app which promises to deliver highly sort after word of mouth and mobilise buyers in a similar way to discounting strategies minus the negative impact on brand health associated with slashing prices. Co-founder and chief operating officer of the service, Carl Fritjofsson, says the retailers Wrapp has worked with overseas, which include big name players Gap, Sephora and H&M, have been surprised to see how high redemption rates are for the vouchers. 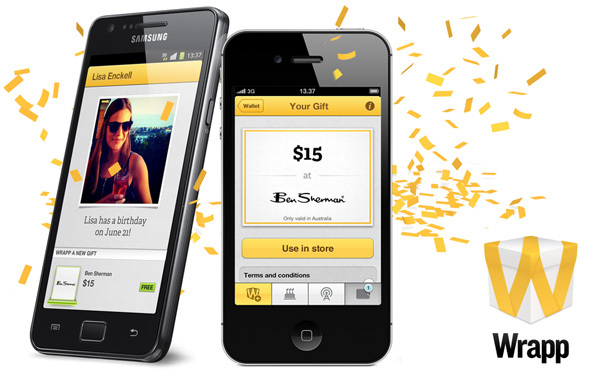 Since launching in November 2011, Wrapp users in seven countries have sent over 2.4 million free and paid gift cards. Users of the app see a list of Facebook friends who they can choose to send free gift vouchers to (usually of $5 or more depending on the brand) or pay for a higher value voucher from a list of available brands. Participating retailers can choose demographic segments to target, and a value per gift receiver to cap free voucher outlay per user. So far results across Wrapp’s merchants place the yield from each sale at between four to six times the value of the free gift card awarded. Wrapp takes its revenue from a flat fee for free vouchers redeemed and a percentage of the value of paid voucher redemptions. Initially launched in Sweden the service has since rolled out to the United States, United Kingdom, Germany, the Netherlands, Finland, Norway, with Australia set to become its eighth market. The venture is backed by Atomico, the London-based venture capital firm started by Skype co-founder Niklas Zennström, and Silicon Valley-based Greylock who’s partner Reid Hoffman co-founded the social network, LinkedIn. A host of other startups, like CashStar, SocialGift, Groupcard Apps and DropGifts, are also rushing to capitalise on the trend. Fritjofsson believes the system has the ability to cash in on, and expand, the $2.5 billion a year Australian gift card sector. It leverages one of the key occasions that Facebook users connect around – reasons to celebrate such as birthdays, engagements and other milestones or achievements. In doing so, it enables retailers to disguise discounting strategies as peer to peer gifting while at the same time generating a story on Facebook about the brand gifted and driving higher conversion rates. Apple is also shaping up to play in the space also with its ‘Passbook’ app, which houses boarding passes, tickets and loyalty cards, and looks to be the precursor to a mobile wallet for the iPhone, set to launch as part of the upcoming iOS6 release. Fritjofsson says there are no plans to integrate Wrapp into Passbook, but that it may well happen in the future.